Nothing hits the spot on a cool day better than beef stew, especially with wine! If you want beef stew, this one is it. I love my mother’s Nova Scotia version with root vegetables, but sometimes something a little richer is just what the doctor ordered. 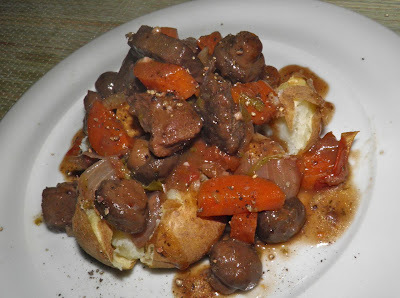 Beef bourguignon, or more properly “boeuf” bourguignon is a haute cuisine classic, but its origins are far less grand than the expensive kitchens of Paris. This meal started out as a peasant dish. Usually anything that simmers a long time has that provenance. Simmering makes less desirable (and therefore less expensive) cuts of meat more tender. Simmering in an acidic liquid (wine) doesn’t hurt either. Beef bourguignon hails from Burgundy in France. This region is also the home of coq au vin (recipe here) and escargot. People either love or hate escarrgot. I am in the former category. In bourguignon (and coq au vin) meat is simmered with onions, garlic, and select other vegetables until all is soft and delicious. 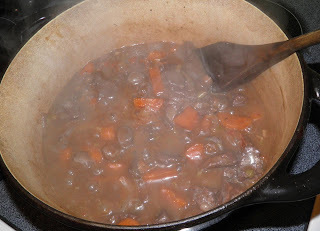 The broth that accompanies the bourguignon is composed of beef stock and red wine. Thank goodness the rural French had easy access to wine or wonderful recipes like coq au vin or bourguignon may not exist. A classic thickener, flour kneaded with butter. The red wine I used was local – a 2011 Castel from Domaine de Grand Pré in the Annapolis Valley. The winery uses 100% Nova Scotia grown grapes. Their Castel is a very nice wine. It is richly flavoured and deep red with notes of pepper and caraway. It pairs perfectly with red meats and root vegetables. Domaine de Grand Pré has won many wine awards. Its award-winning restaurant, Le Caveau, is a perfect place to enjoy the fruits of their labour and a taste of Nova Scotia cuisine at its finest. Nova Scotia actually has a thriving wine industry of which we are rightly proud, with wineries in every area of our small province. Other wineries are also not unfamiliar with international awards as well. Keep that in mind when you’re planning day trips around, or a longer vacation to, our beautiful jewel by the sea. So I’ve done my Bluenose duty by pitching the region (which richly deserves it) so now on to the recipe! Heat the oil in a Dutch oven or other large pot with a cover. Brown the beef. 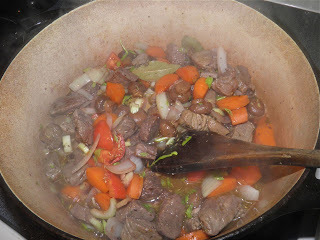 Then add the onion, garlic, carrots, celery, tomato, wine, beef broth, thyme and bay leaves. Season with salt and pepper. Brin the mixture to a boil, reduce the heat to medium-low and cover. Let the pot simmer for 1 hour. 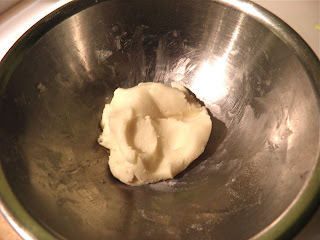 While the stew is simmering knead the butter and flour together with your fingers in a small bowl. This is called a beurre manie (French for kneaded butter). This is the thickener. At the end of the one hour stir in the beurre manie. Let the sauce thicken, remove the bay leaves and serve. Usual accompaniment is mashed potatoes, but this dinnertime I had baked potatoes which I split open and buttered before placing the stew on top. *Never cook with wine you wouldn’t drink. Some of the alcohol burns off, but the taste remains. Garbage in...garbage out.